"Easy, easy, serve with anything you like; kids love this one and so do adults." Whisk eggs, milk, and salt together in a bowl; pour into a shallow dish. Soak bread slices in egg mixture until saturated. Spread softened butter over the bottom of a 10x15-inch jelly roll pan. Sprinkle brown sugar over the butter. 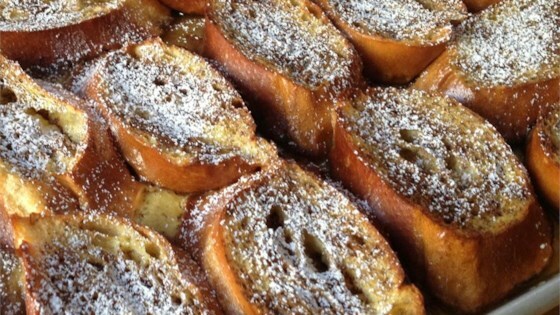 Arrange bread slices onto sugar in a single layer; sprinkle with cinnamon. Bake in preheated oven until beginning to firm, 25 to 30 minutes. Really liked this recipe but next time will add 1/2 tsp real vanilla to the egg/milk mixture. What an easy recipe and SO DELICIOUS!